Iceberg Ice Creams launches its trendy new flavor featuring Charcoal ice cream. Made of coconut ash, with healthy properties of activated charcoal, this treat is both nutritious and delicious! What’s more, if you’re looking for dairy-free ice cream, Iceberg’s charcoal ice cream is the go-to treat. Activated charcoal comes with distinguished properties : it is a cure for hangover, and even remedial for food poisoning. It is detoxifying and has cleansing properties as it is made from coconut shell ash; with intense coconut flavor. Savour it with the flavor of coconut, rich in nutritive elements. Here’s how Iceberg adds nutrition and natural flavors to this exotic ice cream. Food-grade activated charcoal is most frequently produced by heating coconut shells to extremely high temperatures until they are carbonized, or completely burned up. The subsequent cinder is then prepared with steam or hot air at similarly high temperatures to deliver a ‘micro porous structure’. This procedure significantly builds the surface region of the charcoal, which clarifies why it is such an effective detoxifier. “My motto behind every new launch is better nutrition and taste. 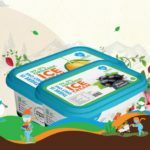 The trend that struck my eye instantly is Charcoal ice cream”, adds Iceberg Ice Creams CEO Suhas B. Shetty, on his recent innovation. The super healthy activated charcoal and the dairy-free ice cream stand out as a healthy combination. Even better, it tastes better with every lick. Let’s top this with a cherry, and this trendy fashionable ice cream lets you rock your Instagram look! Popularly known as Black ice cream and Goth ice cream, this makes your lips blacker. Nothing better for that gothic Instagram look. The look has taken Instagram by storm, and will set forth for the Indian audience with Iceberg Ice Creams. We know you’re excited for this flavor. So are we, to serve it to you with love and lots of cheerful memories!